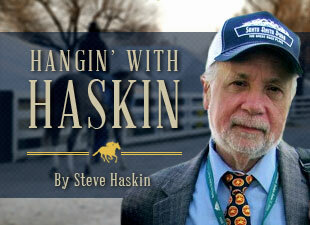 Haskin's Derby Report: And They're Off! So, the post position draw finally is out of the way and none of the major contenders got burned. The Todd Pletcher quintet all drew toward the outside with the exception of Revolutionary, who should be in good shape in post 3 under Calvin Borel, who will take him back and will not have far to go to get him to the rail. This way he won’t have to dart across the entire trip to get to his favorite path. Overanalyze (post 9), Palace Malice (10), Verrazano (14), and Charming Kitten (15) could not have drawn any better, so Pletcher dodged a bullet big-time. As for the pace scenario, poor Oxbow once again drew poorly, but instead of being stuck on the far outside at Oaklawn, he is down in post 2 and will have to come out running. This can be a bad post, but it can also be a good post if he gets a sharp break and a clean trip. Right now, all it means is that he likely will get involved in the pace early. Goldencents, breaking from post 8, no doubt will be tracking him, with Falling Sky (13) and Verrazano coming over from the outside. These four should dictate the pace and it will be interesting to see how long their jockeys play cat and mouse before one of them decides to make the running. Vyjack, in post 20, actually could be in decent shape, outrunning all those immediately to his inside – Java’s War, Frac Daddy, Will Take Charge, Orb, and Charming Kitten, and tracking Verrazano into the first turn. 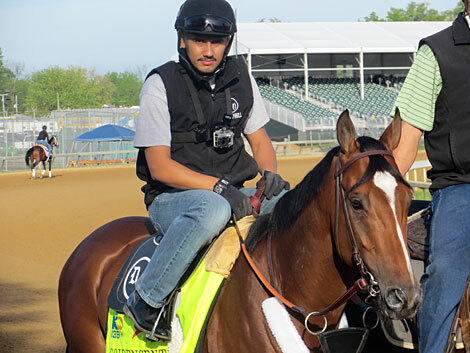 Expect to see Itsmyluckyday, Palace Malice, Overanalyze, Lines of Battle, Mylute, Frac Daddy, and Oxbow in the next flight, with Orb and Normandy Invasion somewhere in mid-pack. Java’s War, Charming Kitten, and Golden Soul likely will bring up the rear, but don’t be surprised to see Normandy Invasion and Orb fairly far back, despite their sharpness in the morning. There was a good deal of talk and published reports Thursday morning about Normandy Invasion running off with his rider for about three furlongs. If this was any race other than the Kentucky Derby, no one would care in the slightest. The feeling here is that running off, whether spooked by something or whatever, will have no bearing at all on how he runs on Saturday. Even if he was timed three-eighths in :38 and change during his run-off, so what? Blowing out three furlongs the day before a race, never mind two days before, used to be a common practice, and those blowouts usually were around :36 to :37 or faster. Some observations from this morning: Itsmyluckyday, once again, had a terrific gallop and could not be doing any better. I liked Revolutionary’s gallop and the way he jogged briskly back, suggesting his energy level is high and he’s feeling good. 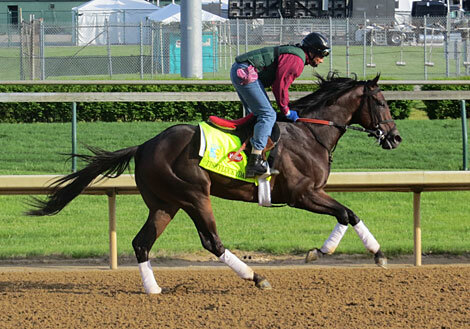 Overanalyze also had a strong gallop and seems to be coming into the race in top shape. One of the most laid back and professional horses is Mylute, who goes out every morning at 5:45. This morning, he went along smoothly, switching leads right on cue. Tomorrow it is time once again to make some semblance of selections. They will be based in part on observations, pedigree (especially with slop), speed figures, general handicapping, and any intangibles, such as, ahem, the Derby gods. All that combined should confuse you even more. 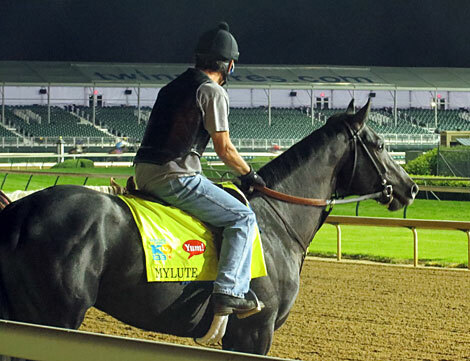 Mylute is the first one out every morning at 5:45. Revolutionary strikes a handsome pose Thursday morning. Itsmyluckyday had another strong gallop. Goldencents drew well and will break from the 8 post. 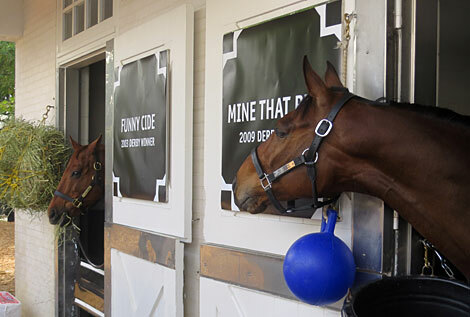 It was great seeing Kentucky Derby-winning geldings Mine That Bird and Funny Cide together at the Kentucky Derby Museum this morning. 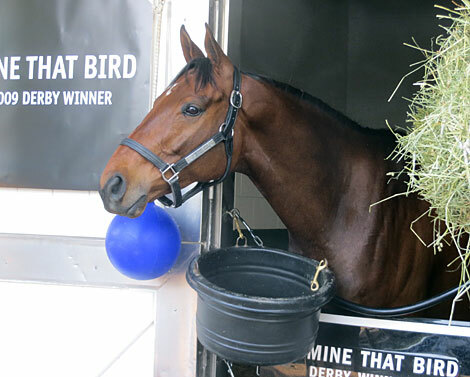 Mine That Bird, who has temporarily taken up residence at the Museum for several months, has made friends with a miniature pony named Winston, but today, he shared his two-stall barn with Funny Cide, who was visiting from the Kentucky Horse Park. 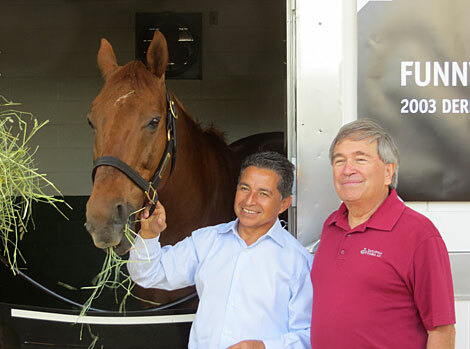 With Funny Cide’s managing partner Jack Knowlton (who couldn’t believe 10 years have passed) and jockey Jose Santos in attendance, along with Mine That Bird’s trainer Chip Woolley, visitors to the museum lined up around 10:30 to visit the two Derby winners and take photos. Both horses then were brought to the paddock before the fifth race, where they received a warm welcome from the scores of fans. Mine That Bird has become a fixture at the Derby Museum. Mine That Bird tries to get Funny Cide's attention. Jack Knowlton and Jose Santos with Funny Cide. 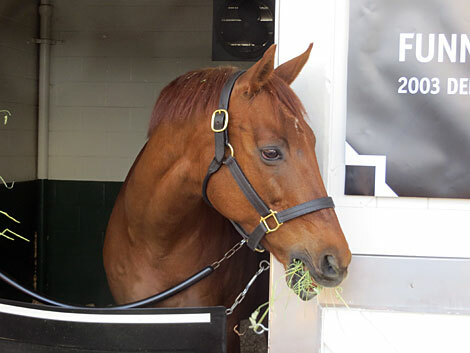 Funny Cide did not stop eating from the minute he arrived. 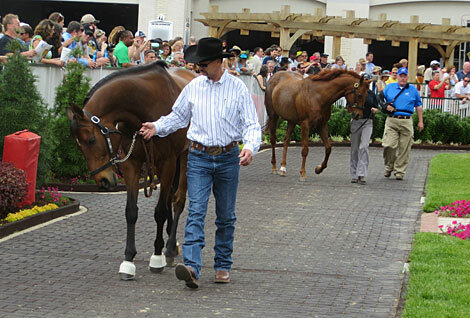 Mine That Bird and Funny Cide in the paddock.